CERTIFICATE OF AMENDMENT OF THE SECOND AMENDED AND RESTATED CERTIFICATE OF INCORPORATION OF NATIONAL FINANCIAL PARTNERS CORP.
Download "CERTIFICATE OF AMENDMENT OF THE SECOND AMENDED AND RESTATED CERTIFICATE OF INCORPORATION OF NATIONAL FINANCIAL PARTNERS CORP."
3 9. (a) This corporation shall, to the maximum extent permitted from time to time by law, indemnify any person who is or was a party or is threatened to be made a party to any threatened, pending or completed action, suit, proceeding or claim, whether civil, criminal, administrative or investigative, (i) by reason of the fact that such person is or was a director of the corporation or any predecessor of the corporation or is or was serving at the request of the corporation or any predecessor of the corporation as a director of another corporation, partnership, joint venture, trust or other enterprise, including service with respect to employee benefit plans or (ii) in such person's capacity as an officer, employee or agent of the corporation or any predecessor of the corporation or in such person's capacity as an officer, employee or agent of another corporation, partnership, joint venture, trust or other enterprise, including service with respect to employee benefit plans, that such person is or was serving at the request of the corporation or any predecessor of the corporation (each such person described in the foregoing clauses (i) and (ii), a Covered Person ), against expenses (including attorney's fees and expenses), judgments, fines, penalties and amounts paid in settlement actually and reasonably incurred in connection with such action, suit, proceeding or claim, and such right to indemnification shall continue as to a person who has ceased to be a director or officer of the corporation or any predecessor of the corporation and shall inure to the benefit of his or her heirs, executors and personal and legal representatives; provided, however, that, except for proceedings to enforce rights to indemnification, the foregoing shall not require this corporation to indemnify any person in connection with any action, suit, proceeding, claim or counterclaim initiated by or on behalf of such person other than an action authorized or consented to by the Board of Directors. Such indemnification and any advancement of expenses conferred in this paragraph 9 shall not be exclusive of other rights which any person may have or hereafter acquire under this Second Amended and Restated Certificate of Incorporation, or any by-law, statute, agreement, vote of directors or stockholders or otherwise. Any person seeking indemnification under this paragraph 9 shall be deemed to have met the standard of conduct required for such indemnification unless the contrary shall be established. 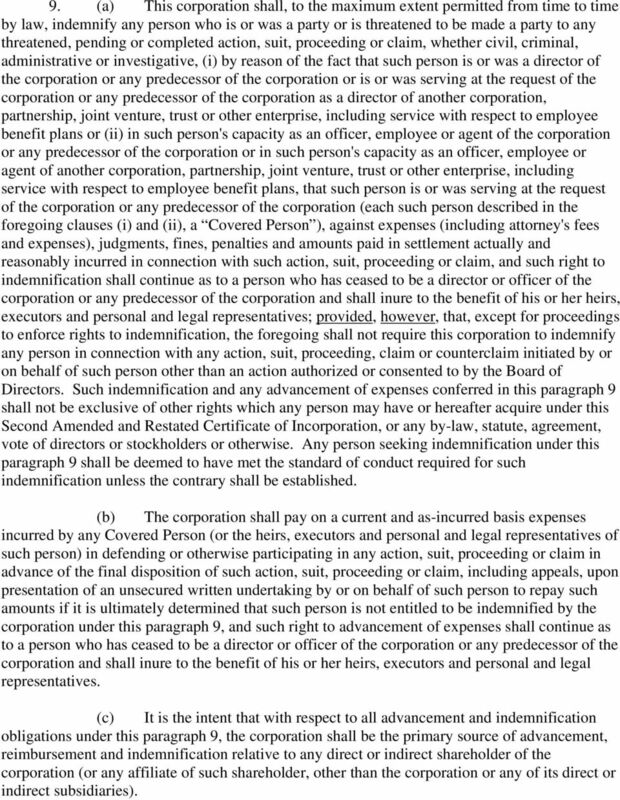 (b) The corporation shall pay on a current and as-incurred basis expenses incurred by any Covered Person (or the heirs, executors and personal and legal representatives of such person) in defending or otherwise participating in any action, suit, proceeding or claim in advance of the final disposition of such action, suit, proceeding or claim, including appeals, upon presentation of an unsecured written undertaking by or on behalf of such person to repay such amounts if it is ultimately determined that such person is not entitled to be indemnified by the corporation under this paragraph 9, and such right to advancement of expenses shall continue as to a person who has ceased to be a director or officer of the corporation or any predecessor of the corporation and shall inure to the benefit of his or her heirs, executors and personal and legal representatives. (c) It is the intent that with respect to all advancement and indemnification obligations under this paragraph 9, the corporation shall be the primary source of advancement, reimbursement and indemnification relative to any direct or indirect shareholder of the corporation (or any affiliate of such shareholder, other than the corporation or any of its direct or indirect subsidiaries). 4 (d) This corporation shall have the power to purchase and maintain, at its expense, insurance on behalf of any person who is or was a director, officer, employee or agent of the corporation, or is or was serving at the request of the corporation as a director, officer, employee or agent of another corporation, partnership, limited liability company, joint venture, trust or other enterprise, against any expense, liability or loss asserted against such person and incurred by such person in any such capacity, or arising out of such person s status as such, whether or not the corporation would have the power to indemnify such person against such expense, liability or loss under the DGCL or the provisions of this Second Amended and Restated Certificate of Incorporation. 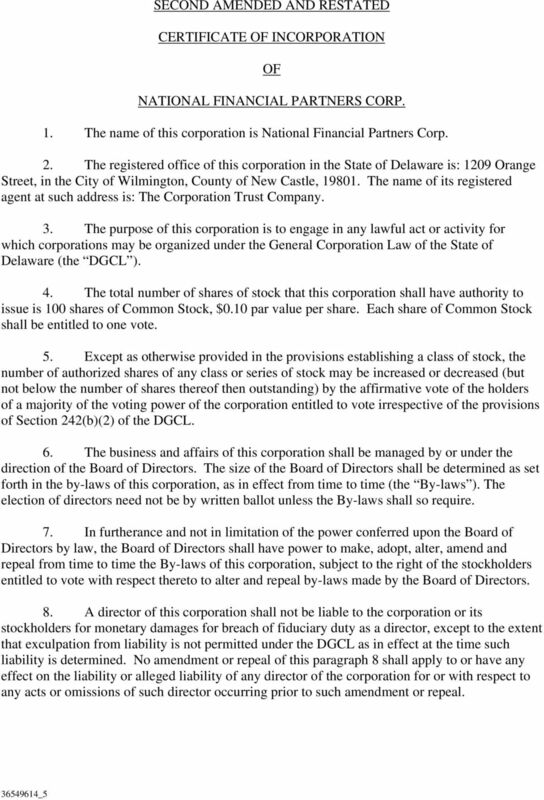 (e) The corporation may, to the extent authorized from time to time by the Board of Directors, provide rights to indemnification and to the advancement of expenses to employees and agents of the corporation similar to those conferred in this paragraph 9 to the directors and officers of the corporation. (f) The provisions of this paragraph 9 shall not be deemed to preclude the indemnification of and the advancement of expenses to any person who is not specified in this paragraph 9 but whom the corporation has the power to indemnify under law or otherwise. (g) Any repeal or modification of the foregoing provisions of this paragraph 9 shall not adversely affect any right or protection of a Covered Person (or the heirs, executors and personal and legal representatives of such person) with respect to any acts or omissions of such Covered Person occurring prior to such repeal or modification. 10. To the maximum extent permitted from time to time under the law of the State of Delaware, this corporation renounces any interest or expectancy of the corporation in, or in being offered an opportunity to participate in, business opportunities that are from time to time presented to its officers, directors or stockholders, other than those officers, directors or stockholders who are employees of the corporation. 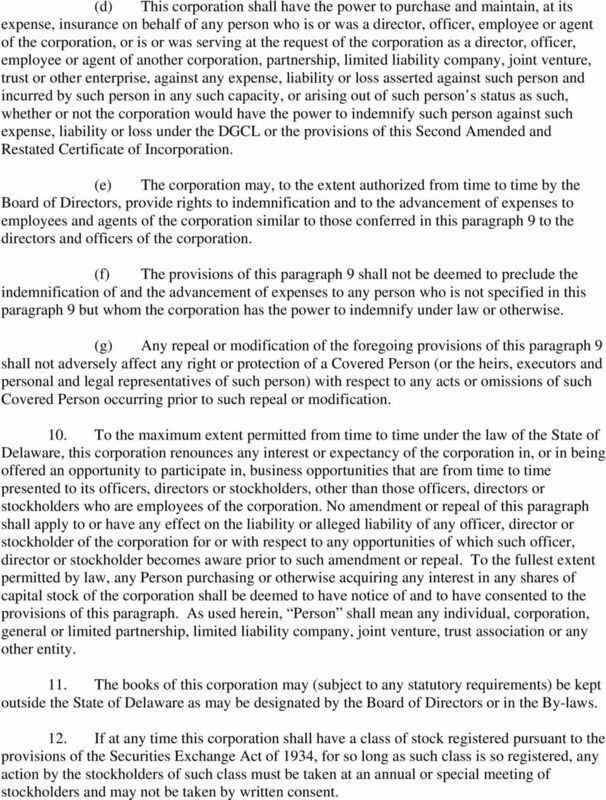 No amendment or repeal of this paragraph shall apply to or have any effect on the liability or alleged liability of any officer, director or stockholder of the corporation for or with respect to any opportunities of which such officer, director or stockholder becomes aware prior to such amendment or repeal. To the fullest extent permitted by law, any Person purchasing or otherwise acquiring any interest in any shares of capital stock of the corporation shall be deemed to have notice of and to have consented to the provisions of this paragraph. As used herein, Person shall mean any individual, corporation, general or limited partnership, limited liability company, joint venture, trust association or any other entity. 11. The books of this corporation may (subject to any statutory requirements) be kept outside the State of Delaware as may be designated by the Board of Directors or in the By-laws. 12. If at any time this corporation shall have a class of stock registered pursuant to the provisions of the Securities Exchange Act of 1934, for so long as such class is so registered, any action by the stockholders of such class must be taken at an annual or special meeting of stockholders and may not be taken by written consent. THIRD AMENDED AND RESTATED CERTIFICATE OF INCORPORATION OF PEABODY ENERGY CORPORATION Adopted May 21, 2001 (As Amended Through September 30, 2015) FIRST: The name of the corporation is Peabody Energy Corporation. RESTATED CERTIFICATE OF INCORPORATION OF AUTOLIV, INC.
FOURTH AMENDED AND RESTATED CERTIFICATE OF INCORPORATION LIVEPERSON, INC.
STATE OF DELAWARE CERTIFICATE OF AMENDMENT OF AMENDED AND RESTATED CERTIFICATE OF INCORPORATION OF AMTRUST FINANCIAL SERVICES, INC. CERTIFICATE OF INCORPORATION CORE-MARK HOLDING COMPANY, INC. ARTICLE ONE. The name of the Corporation is Core-Mark Holding Company, Inc. AMENDED AND RESTATED CERTIFICATE OF INCORPORATION OF SUNCOKE ENERGY, INC. RESTATED CERTICIFATE OF INCORPORATION THE WALT DISNEY COMPANY ARTICLE I NAME. The name of the Corporation is The Walt Disney Company. 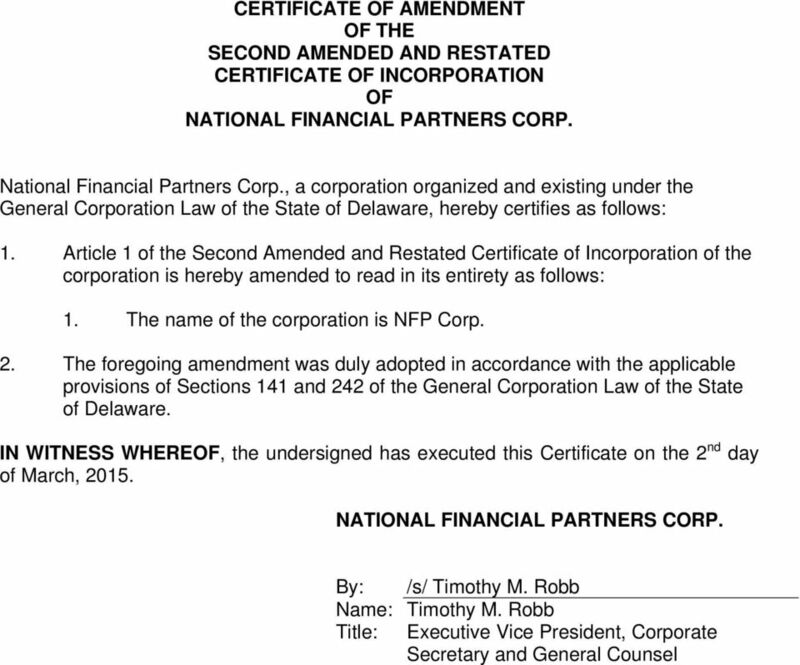 AMENDED AND RESTATED CERTIFICATE OF INCORPORATION OF DR PEPPER SNAPPLE GROUP, INC. AMENDED AND RESTATED CERTIFICATE OF INCORPORATION OF SCIENCE APPLICATIONS INTERNATIONAL CORPORATION FIRST: NAME. The name of the Corporation is Science Applications International Corporation. SECOND: ADDRESS. AMENDED AND RESTATED CERTIFICATE OF INCORPORATION OF UNIVERSAL BIOSENSORS, INC. RESTATED CERTIFICATE OF INCORPORATION OF APPROACH RESOURCES INC.
STATE of DELAWARE. RESTATED CERTIFICATE of INCORPORATION of JACK HENRY & ASSOCIATES, INC. CERTIFICATE OF INCORPORATION OF ERF WIRELESS, INC. The name of the corporation is ERF WIRELESS, INC. RESTATED CERTIFICATE OF INCORPORATION LOOKSMART, LTD. AMENDED AND RESTATED CERTIFICATE OF INCORPORATION OF GEOMET, INC. AMENDED AND RESTATED CERTIFICATE OF INCORPORATION OF HERTZ GLOBAL HOLDINGS, INC. AMENDED AND RESTATED CERTIFICATE OF INCORPORATION of BAXTER INTERNATIONAL INC. AMENDED AND RESTATED CERTIFICATE OF INCORPORATION OF MORGAN STANLEY The present name of the corporation is Morgan Stanley. The corporation was incorporated under the name "Sears Acquisition Corporation"
THIRD AMENDED AND RESTATED CERTIFICATE OF INCORPORATION NYSE MARKET (DE), INC. AMENDED AND RESTATED CERTIFICATE OF INCORPORATION OF HCA HOLDINGS, INC. RESTATED ARTICLES OF INCORPORATION of PHILIP MORRIS COMPANIES INC. ARTICLE I. The name of the Corporation is PHILIP MORRIS COMPANIES INC. AMENDED AND RESTATED CERTIFICATE OF INCORPORATION OF THE HOME DEPOT, INC.
SECOND AMENDED AND RESTATED CERTIFICATE OF INCORPORATION OF SERVICEMASTER GLOBAL HOLDINGS, INC.
SECOND AMENDED AND RESTATED CERTIFICATE OF INCORPORATION OF SERVICEMASTER GLOBAL HOLDINGS, INC. FIRST. Name. The name of the Corporation is ServiceMaster Global Holdings, Inc. SECOND. Registered Office. AMENDED AND RESTATED CERTIFICATE OF INCORPORATION OF AQUABOUNTY TECHNOLOG IES, INC. AMENDED AND RESTATED CERTIFICATE OF INCORPORATION DELTA AIR LINES, INC. RESTATED CERTIFICATE OF INCORPORATION DELAWARE STATE BRIDGE ASSOCIATION, INC. RESTATED CERTIFICATE OF INCORPORATION OF DELAWARE STATE BRIDGE ASSOCIATION, INC. Pursuant to Section 245 of the General Corporation Law of the State of Delaware Delaware State Bridge Association, Inc. AMENDED AND RESTATED CERTIFICATE OF INCORPORATION OF DEX MEDIA, INC. (originally incorporated on August 17, 2012, under the name Newdex, Inc.
FIRST: The name of the Corporation is The Barth Syndrome Foundation, Inc. (the Corporation ). SECOND AMENDED AND RESTATED CERTIFICATE OF INCORPORATION OF EP ENERGY CORPORATION. 1. The name of the Corporation is EP Energy Corporation. THIRD AMENDED AND RESTATED CERTIFICATE OF INCORPORATION SKILLED HEALTHCARE GROUP, INC. (ORIGINALLY INCORPORATED AS SHG HOLDING SOLUTIONS, INC. AMENDED AND RESTATED CERTIFICATE OF INCORPORATION WOLVERINE WORLD WIDE, INC.
LIMITED LIABILITY COMPANY AGREEMENT OF. Friends of Cornerstone Academy, LLC. A Delaware Limited Liability Company. Dated and Effective. Amended and Restated ARTICLES OF INCORPORATION CTS CORPORATION ARTICLE I. Name. The name of the corporation is CTS Corporation (the "Corporation").